Millions of Jan Karon fans will be thrilled that it's life as usual in the wildly popular Mitford series: a beloved town character lands a front-page obituary, but who died? And what about the former mayor, born the year Lindbergh landed in Paris, who's still running for office? All this, of course, is but a feather on the wind compared to Muse Editor J.C. Hogan's desperate attempts to find a cure for his marital woes. Will it be hi-def TV or his pork chop marinade? At Meadowgate Farm, newlyweds Dooley and Lace Kavanagh face a crisis that devastates their bank account. But there is still a lot to celebrate, as their adopted son, Jack, looks forward to the most important day of his life-with great cooking and lots of people who love him. 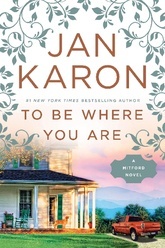 Jan Karon is the author of the bestselling series of thirteen Mitford novels, featuring Episcopal priest Father Timothy Kavanagh and the fictional village of Mitford. She is also the author of twelve other books, including a cookbook and several books for children. Karon lives in Charlottesville, Virginia.